Congressman Green I am challenging you to prove your charge that our beloved Minister and teacher is a bigot! I am highly offended and personally disgusted with you sir because you have called a man that I love, respect and who is my teacher a bigot, and yet you offer no proof! There are millions of people who are supporters and followers of Minister Farrakhan, especially in the Black community. We are all offended that a member of one of the most powerful legislative bodies in the world, would falsely accuse our beloved Minister of being a bigot when he has been a teacher of righteousness to us. Minister Farrakhan has been the most courageous leader that the Black community has had for the past 40 years. And we love him and refuse to back away from him to appease and pleasure our 460-year-old adversaries. I understand that politics makes strange bed-fellows, but sir you seem to be working very hard to please those that you are in bed with; those that would get joy and excitement in pressuring a prominent member of the Black community to join in with them to condemn Minister Louis Farrakhan as a bigot. Have you no self-respect? Where is your strength to stand against the pressure of the “wiles of Satan”? Do you really believe that the white ruling class in America should be the ones who approve Black leadership? Black leadership would not even be a category of leadership had not it emerged as a necessary response to the actual bigotry, oppression, violence and subjugation of Black people in American society. It’s a fundamental truth that the oppressors can’t pick and choose those who will lead the oppressed along the path of liberation. The Most Honorable Elijah Muhammad said this same truth, but he phrased it like this “a man who won’t treat you right, won’t teach you right.” Why are you allowing the Black community’s most ardent adversaries to be your teacher and adviser where Minister Farrakhan is concerned? These are the same people who have a vested interest in the maintenance of the status quo in America, a status quo characterized by an ever-increasing wealth gap between Black poverty and White wealth. You have taken issue with Minister Farrakhan’s use of a common and frequently used political metaphor. Watch the video below and see how frequently political and ideological rivals have used the “termite metaphor” to refer to those whom they oppose. You know that the Minister was not referring to the Jews as termites. He was referring to exploiters, corrupters and deceivers who settle inside the Black community to benefit themselves and to leave Black people poorer and more ignorant. These who practice “termitic behavior” are comprised of groups from nearly all of the races, ethic groups and religions that make up America. And these are whom the Minister was referring to, and not referring to their persons, but to their destructive practices inside poor communities of color. Let me remind you, that Minister Farrakhan has repeatedly called for a public showdown so that he may answer his accusers in public. And yet none of those who label him as a bigot or anti-Semite will accept the challenge to prove what they say about our beloved Minister. That fact, in and of itself, is very revealing. 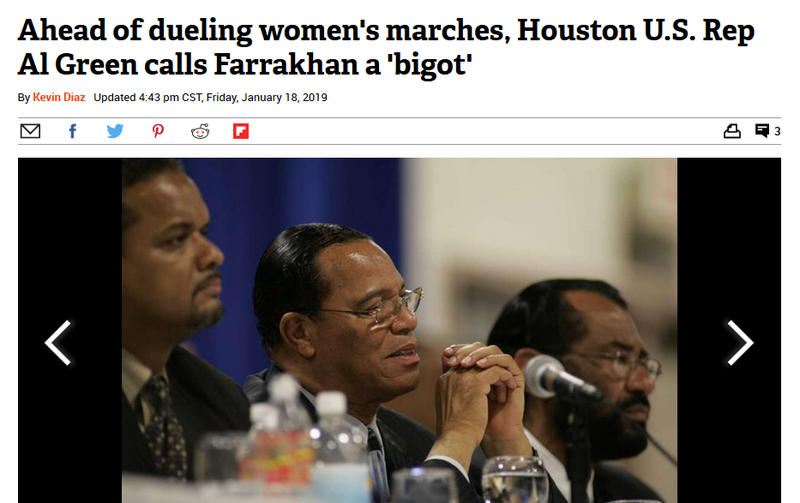 If they really believed Minister Farrakhan was a bigot, then arrange for him and his ideas to be on public display so that he might be exposed for the world to see. The fact that they won’t show up for a showdown with the Minister and his students is an indicator that they are false in what they assert and are guilty of the slander of a righteous man! I am not going to spend a lot of time and a lot of words dealing with you Congressman Green. You sir are no dummy; you are nobody’s ignoramus. You know the Minister is not what you proclaim. But you have slandered our beloved Minister’s name to appease those whom you fear! Shame on you sir! You are a great disappointment. You ought to seriously seek some help or therapy, because you are other than yourself. You are by nature a righteous man; a truthful man; a noble man. But your slander against our beloved Minister is an identifying marker that fear has gripped you and that you have backed away from principle. Since it is the media and Jewish organizations that are responsible for your false conclusions drawn regarding Minister Farrakhan, you ought to read what a white pastor named William Alberts wrote about Minister Farrakhan when he performed an extensive study of the media’s mistreatment of Minister Farrakhan during the time of the Million Man March. His researched findings mirror the mistreatment of the Minister today. Rev. 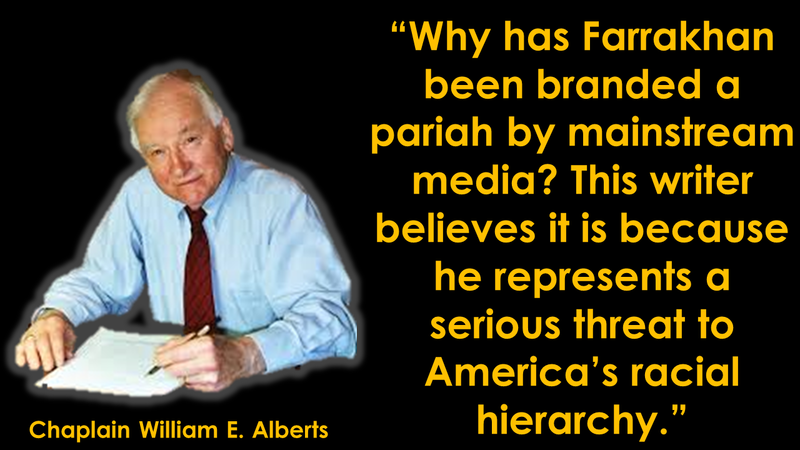 Alberts concludes his examination of the Minister’s mistreatment, of which your ill-advised words sir have added to, by pointing out the following: “Why has Farrakhan been branded a pariah by mainstream media? This writer believes it is because he represents a serious threat to America’s racial hierarchy. The hierarchy cannot control or buy his accommodation or “integration” as a Black leader. He dares to point out and challenge the “white supremacy” of the “founding fathers,” forcing White America to recognize and deal with the fact that many of the signers of the Declaration of Independence, which declared freedom and equality for all, were themselves slave holders, and that even “Honest Abe” had a racist “wart” or two that can no longer be covered up. 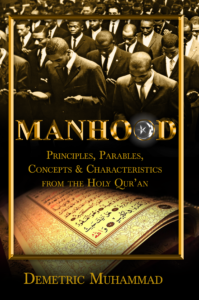 Farrakhan also has the power to initiate a call that led at least twice, and possibly three or more times as many African-American men to respond as the U.S. Park Police counted – in spite of all the print aimed at discrediting the Nation of Islam leader and derailing the March. 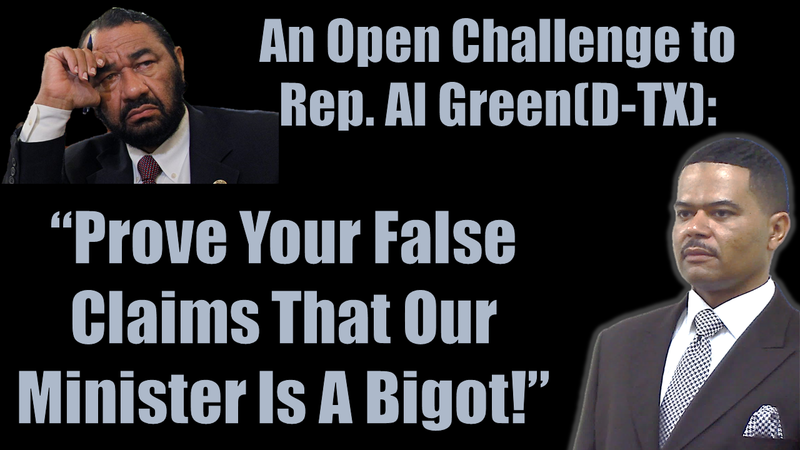 Congressman Green, your condemnation of Minister Farrakhan is both wrong and worthless. The Minister is not a politician. He is a Messenger of God. Were he to condemn you, then both God and the masses of the people would be your adversaries. But you sir, are not even in the same league with our beloved Minister. He is your elder, and he has been, and is, much stronger in his record of service than you. Truth be told, Minister Farrakhan dwarfs you in all areas of leadership and community service. Just because you’ve been in a few meetings with the Minister, you think you are on his level as something of a peer. Nothing could be further from the truth. For your condemning of Minister Farrakhan, you owe Minister Farrakhan and the Black community an apology and a retraction of your false statements. Sir, your people would much rather see you condemn the litany of persons who maintain a negative presence among us. Why don’t you place within the cross-hairs of condemnation, those who have weaponized popular culture against our youth. Why don’t you condemn those responsible for the nefarious “school to prison pipeline.” Why don’t you condemn those who perpetuate ignorance and vice within the Black community. Your people Mr.Congressman sent you to Washington to work for us. And since we love Minister Farrakhan, if you represent us, you need to act like you do to. Otherwise, come election time, you are going to have a lot of angry voters who love Minister Farrakhan and live in your district. They may decide to vote in someone who isn’t afraid to stand up to the Black community’s adversaries and who has enough integrity not to turn on a man who has been a friend and brother to us all.